Our esteemed clients can avail from us a wide range of Multi Coloured Threads. These are made of high quality raw material with the help of latest technology and sophisticated machines. Our range of high tensile strength threads is used to stitch and manufacture leather bags, boxes, sports covers, buff rolls, saddles and other products. Moreover, our range is available in different colors and sizes and can also be customized to meet the requirement of the customers. 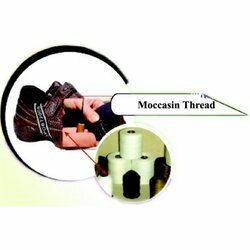 We provide a wide assortment of Moccasin Threads which are widely used for stitching shoes. We manufacture these using modern machinery and process technology to ensure smooth color and surface finishing. They are well known for their salient features like high tensile strength, excellent finish and flexibility. These are widely used in demanded in garment and textile industries. Our ranges of products are tested on several parameters by our quality inspectors before the final delivery to our customers. Looking for “Multi Coloured Threads”?